“I started the Atkins Diet many times before, but never had this much success. I have lost 40 pounds…this diet works for me. My motivation was that my father died of cancer last April and I was on a mission to become healthy. I was 38 years old never did drugs a day in my life! My drug of choice was food. No smoking, no drinking. I could not understand why God would take the only person who ever loved me my whole life! My mother never raised me. She too had died years earlier from AIDS. She was a heroin addict. I was on a mission. 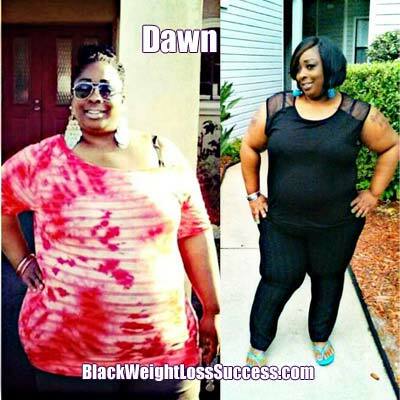 I started at my highest weight ever, 347 pounds at 5’3″ tall. I started working out every day. The first day was hell. I kept telling myself you can make it! I started out walking one mile a day for three days a week. My husband would walk with me every morning. Later, I started going to the gym and doing the treadmill. Awesome Job !!! much continued Success you’re looking Great …..
You’re doing an amazing job! Keep it up and don’t look back. Stay strong! Awesome job! I just started Atkins also! Thanks for the motivation! Although your parents are gone -God hasn’t left you!!! Keep up the good work diva! !